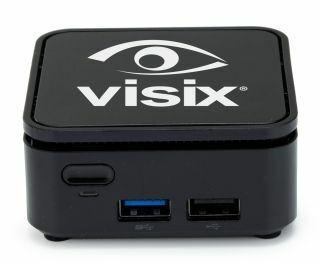 The What: Visix has added a new Nano player to its digital signage hardware offering. The ultra-small form factor appliance is purpose-built to provide reliable 1080p playback for digital signs in the smallest package available, measuring just 2.75 inches square. The Bottom Line: The Nano player is Visix’s smallest and most affordable media player, with robust features like 64GB eMMC storage, 4GB LPDDR4 memory for performance, and support for wired and wireless networking. It is powered by the Intel Apollo Lake Celeron N3350 Processor, and comes with a Kensington security port.